Sour Power® has the taste that kids (and kids of all ages) love! Since 1985, Sour Power® has been offering a variety of shapes, packages, and mouth-watering flavor varieties that people can't seem to get enough of! 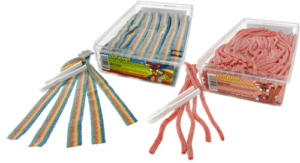 Try our Sour Straws, Belts, and other great products in all your favorite flavors!